Pleural mesothelioma is a cancer that is found in the sac lining of the chest, covering areas around the lungs and inside the ribs. The tumor on the pleura encases and invades the lung parenchyma in late stages of the disease. The only known cause to this disease is exposure to asbestos. Due to the latency effect of this cancer, this exposure is likely to have taken place 20 or more years ago. This type of mesothelioma is the most prevalent and is found in over 70% of the cases. Median survival time of about 9 months after diagnosis. Pleural mesothelioma is an aggressive cancer that starts in the mesothelial cells, found on the pleura of the lung and the lining of the chest cavity, typically on one side only. There are three main areas of the body where mesotheliomas can start, but 3 out of 4 of these cancers start in the chest, making them pleural mesotheliomas. 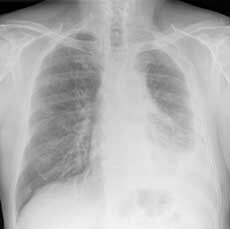 Pleural mesotheliomas occur mostly in 60-80 year old men who have been exposed to asbestos. Benign pleural mesotheliomas are treated by surgical removal, but the treatment of the three malignant versions of these tumors is more complicated. The stage of the cancer and how far it has spread as well as the type of tumor all influence the regimen that the patient and his or her cancer team will design to treat the specific diagnosis. Oftentimes, patients diagnosed with pleural mesotheliomas will be referred to specialists who are better versed in the treatment of this diagnosis, where the care team works with the patient to make customized treatment decisions. There are some cases of pleural mesothelioma that are considered potentially curable when the tumor is thought to be localized. If the diagnosis is Stage I or some Stage II and III, a pleurectomy/decortication is often performed to surgically remove the pleura where most of the tumor is found. If the tumor cannot be removed without taking the entire lung, then a pnemonectomy can be performed where the entire lung is removed. For patients who have localized epithelioid mesothelioma, an extensive surgery called an extrapleural pnemonectomy may be considered, where the entire affected lung is removed along with some surrounding tissue (the diaphragm and pericardium must be reconstructed). This surgical procedure is only recommended for otherwise healthy patients who meet specific criteria, as major complications occur 25% of the time. Laboratory tests and cancer blood tests can help your doctor in diagnosing cancer. Learning more about cancer blood tests and how they work will help reduce your anxiety. It is quite rare that blood tests alone can confirm or deny the occurrence of cancer. In case cancer is suspected, your doctor can order specific cancer blood tests or other types of laboratory tests. For example, an examination of your urine or a biopsy of the suspected area or part of the body may be recommended to achieve a proper diagnosis. Although blood tests alone cannot be used to differentiate between a cancerous and non-cancerous condition, they can provide vital clues as to what is happening inside your body. Even if your doctor has prescribed cancer blood tests and other laboratory tests, it does not imply that cancer has been diagnosed. If your doctor has ordered cancer blood tests, find out what exactly are the objectives of these tests. Blood samples or other types of test samples such as fluid, tissue or urine are examined in a lab to find evidences that may indicate cancer. The samples can reveal proteins, cancer cells or other substances that may indicate the presence of cancer. Results obtained through blood and urine tests can also help the doctor to check if your organs are functioning properly or if the tumor has started affecting them. Complete Blood Count (CBC): This test is used for measuring the total amount of different types of blood cells as might be present in a blood sample taken from your body. It may detect blood cancers if results indicate too few or too many of a particular type of blood cell or if abnormal cells have been found. The diagnosis of blood cancer is confirmed through a bone marrow biopsy. Urine cytology: A microscopic analysis of urine sample can reveal the presence of cancer cells that may be originating from the kidneys, ureters, or the bladder. Blood protein testing: This test involves analysis of different types of proteins present in your blood (electrophoresis). It can be used to detect certain abnormal proteins in the immune system (immunoglobulins) that sometimes display an elevated presence in individuals with multiple myeloma. Some other tests, including the bone marrow biopsy, are done to confirm the suspected presence of cancer. Tumor marker tests: Chemicals produced by tumor cells, which can be identified in your blood are called tumor markers. However, normal cells can also produce tumor markers and elevated levels have been recorded even in non-cancerous conditions. This is why tumor marker tests have limited use in the diagnosis of cancer. The perfect method of using tumor markers in cancer diagnosis is yet to be determined. Moreover, there have been controversies associated with the use of certain types of tumor marker tests. Currently, a variety of tumor markers are available such as calcitonin used for medullary thyroid cancer, prostate-specific antigen (PSA) used for prostate cancer, alpha-fetoprotein (AFP) used for liver cancer, human chorionic gonadotropin (HCG) used for germ cell tumors (ovarian and testicular cancer) and cancer antigen 125 (CA 125) used for ovarian cancer. Test results should be analyzed carefully since there are several different factors that can affect outcomes, for instance, changes in your body or may be even what you eat. Moreover, always remember that sometimes non-cancerous conditions can lead to abnormal test results. There may also be cases when blood test results may not reveal anything unusual and yet cancer may be present. Generally, your doctor will try to find out if your test results are within a normal range. Your doctor can also compare the test results with your past tests. Although your doctor can obtain important clues based on the blood and urine test results, other tests are generally necessary to confirm or deny a suspected diagnosis. For most types of cancer, a biopsy (the process used to get a tissue or fluid sample from the suspected site) is often necessary in order to make a definitive diagnosis. In specific cases, tumor markers levels may be monitored on a regular basis. A follow-up testing may be scheduled by your doctor in a few months. Tumor markers are best utilized after a confirmed cancer diagnosis. With the help of these tests, your doctor can check if the cancer is responding to therapy or if it is still growing. You can request your doctor to elaborate on the test results. Feel free to discuss issues such as what the test results have to say about your health and what may be the next steps. Management of fatigue from pleural mesothelioma. * Cooper, Hart, Leggiero & Whitehead, PLLC** is located in The Woodlands, Texas (the greater Houston area) and can be reached at 1-800-998-9729 for more information on Mesothelioma. The firm partners are not medical doctors. The information in these pages is for the education of asbestos cancer patients and their families regarding potential medical and legal options. Patients are advised to consult with a medical doctor. ** Licensed by the Supreme Court of Texas.